According to the Social Security Trustees, the program’s trust funds will run out in 2034, when it turns 99 years old. Today’s 50-year-olds will be reaching the normal retirement age and today’s youngest retirees will turn 79. For a typical worker who is 50 years old today, insolvency will lead to a 22 percent cut in lifetime benefits, reducing their retirement income by over $108,000 compared to scheduled levels. See how old you will be when Social Security’s trust funds run out and how much you stand to lose here. Luckily, there is still time to avoid insolvency while enacting changes that protect current retirees, enhance benefits for the most vulnerable, grow the economy, and give all workers time to plan and adjust. 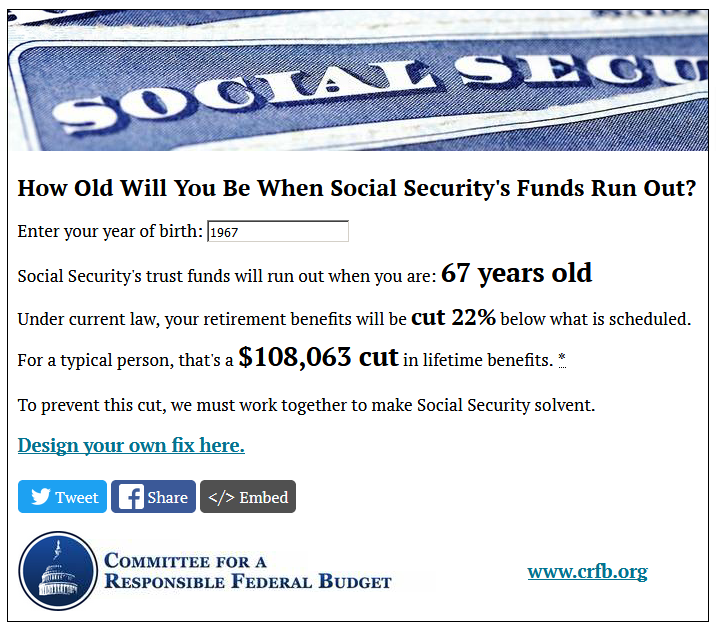 Our Social Security Reformer allows users to design their own plan to fix Social Security. The longer policymakers delay action, however, the harder it will be to fix the program. Time is running out to put forward thoughtful reforms instead of last-minute benefit cuts or tax increases. Policymakers should enact a plan to make Social Security sustainably solvent as soon as possible. Plans from House Ways and Means Social Security Subcommittee Chairman Sam Johnson (R-TX), Ranking Member John Larson (D-CT), and the Bipartisan Policy Center all provide helpful blueprints to work from. At a minimum, Republicans and Democrats should agree to establish a bipartisan Social Security commission tasked with finding a solution to the program’s solvency challenge, as we recently recommended in our Mini-Bargain. A similar commission helped save Social Security in 1983, and it could do the same today. Social Security helps millions of Americans, and the program has a lot to celebrate on its 82nd birthday. But in order for Social Security to have another successful 82 years, policymakers should work together on a comprehensive plan for Social Security solvency.